It doesn't take long to realise that Akrotiri was a very important commercial and cultural centre. The oldest findings date as far back as the Late Neolithic Era (4th millennium b.C. ), while the settlement reached its peak during the Middle and Early Bronze Era (20th – 17th century b.C. ), as one of the most important ports of the Aegean Sea. Its commercial connections reached as far as continental Greece, the islands of Dodecanese, Cyprus, Syria and Egypt. The sheer size of the settlement at 200 hectacres, with its excellent uban planning, its sewage disposal system – so ahead of its time, and its multi-storey buildings, so excuisitely decorated with rich furnishings, household equipment and murals paintings, are all proof: This was a very imporant urban center and the people who inhabited it were privy to an advanced lifestyle. Unfortunatelly, the settlement's life came to an abrupt stop during the last quarter of the 17th century b.C., when most of its inhabitants abonded their homes driven away by strong earthquakes. They were the prelude of the grand volcanic eruption that destroyed everything in its wake. Ash and lava covered the settlement in Akrotiri, preserving exactly it was. Here is an account of how a day in the life of those times might have been, as seen through the eyes of a young boy and inspired by the actual findings the contemporary visitor has the chance to admire in Akrotiri today. “I woke up when the earth started shaking again. It has been happening more and more lately. My mother tells me not to worry, that it is just the demons of the earth dancing beneath us. But, I am worried. I heard the men talk about moving away from the settlement, if the earthquakes continue. The sun hasn't come up yet, but I decide to get up and watch the day breaking over the bay. I love the colors the murals on my dormitory walls take as soon as the first rays hit them – the monkeys come alive and I imagine them jumping up and down. My sister, over at the dormitory next door, told me that she could almost see the antilopes on her wall galloping gracefully yesterday, what with the morning light shadows and the earth trembling once again. Book now our Santorini hotel: Spiliotica! I find my way through the school complex, all four buldings heavily decorated with murals. I am now old enough to follow the courses taught in the Spring room, and I am really grad because this is my favourite of all the murals painted throughout our city. The rocky scenery reminds me of my favourite place on our land, and the red lillies depicted are my favorite flowers. I don't really care for the swallows flying above the image – don't really like birds in general. But, the painter wanted to include them to signal the beginning of spring, I guess.... And now, the teacher is angry because I have drifted away again looking at the mural. I need to focus on my circular writing plaque. It is really difficult to get the hang of all these symbols, even more so now that they are carved spinning around on this round plaque! A few hours later, I am finally free to go. I am anxious for the day to progress, because a very important event has been scheduled for this afternoon and the whole town is going to attend. The merchant men have brought many new and exciting things back from their long travels and they are going to present some of them as gifts to our High Authority. On my way to the Main Hall, I pass by the Women's House to say hello to my sister and return a few parchments I borrowed from the library the day before. My sister sits at her usual spot, next to our mother's loom, learning the craft alongside her. I give them both a kiss, and head to the library. It always amazes me how the structure of this building, with the large air shaft running through the middle, allows all this bright light come in, so that the women can better check their handiwork and the readers can earn a little more reading time. I prefer to run to the Main Hall and admire the murals adorning the walls there: a procession of men bearing gifts. Soon, the pictures on the walls are going to become alive, since the event planned for today is a live procession of exactly this ceremony, the celebratory bringing of gifts to honour our chosen patrons. 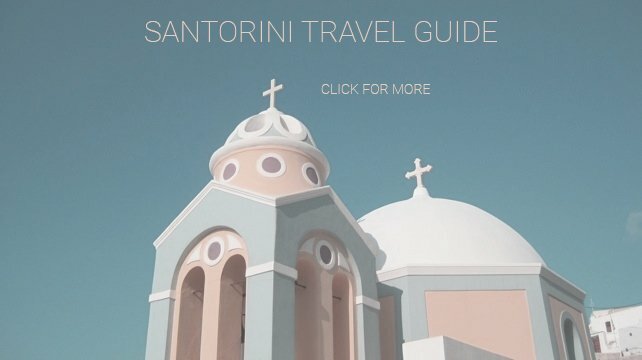 Do you need more ways to explore Santorini at 2016? Check this one!